Rick Bass has a new project with Stellarondo in which narrative and music come together in a “welcome exploration of some serious ‘what if’ questions.” Check it out here. Bill Roorbachvisited Books Alive 2014, the annual festival of reading and writing put on by the Bay County Public Library Foundation at FSU-PC. Robert Olen Butlerparticipated in Mississippi State University’s first writer-in-residence program. We’ll be living it up at the AWP conference in Seattle next week. 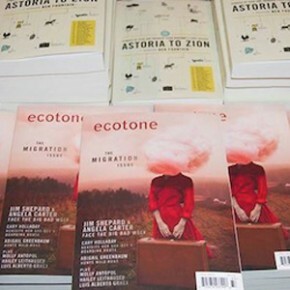 Please visit us at tables A34/A35, and come support our contributors who are reading at the Astoria to Zion release party on Friday, February 28, 6–9 p.m., at the Sorrento Hotel. You won’t want to miss Ben Fountain, Brock Clarke, Cary Holladay, or Rebecca Makkai. See you there.